Enrich and extend your students' understanding of 4 digit numbers with this simple but effective number assignment. 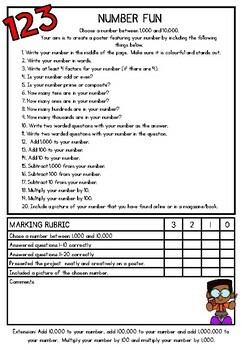 Perfect as an extension for those early finisher or just as an assignment at the end of a place value module. This work beautifully for my more advanced students who needed a deeper learning of 4 digit numbers. $1 deals were created because, as a teacher, I understand the frustration of finding the perfect worksheet for your class, only to discover it is part of a worksheet pack and you are unable to obtain the specific worksheet that you want without purchasing the entire product.